Recently, I made an expansion card based on CPLD Altera epm3256. The main purpose of this card is the logical analyzer of the ISA bus signals. In addition, the card has an SD and minijack 3.5 connector. I did implement ports 0x378 and 0x278 for the emulation of two Covox's at LPT1 and LPT2. So, minijack left channel - covox at LPT1 and right channel - covox at LPT2. This is a stereo using two covox's. BUT when i chose LPT1+LPT2 and check checkbox "Stereo" - FastTracker halted. Sometimes, unexpected exit to DOS with debug information about registers and stack. Last edited by Tronix on 2018-10-19 @ 12:33, edited 1 time in total. how it behaves if you have not ticked that "Stereo", but have the LPT1+LPT2 ? The FT2 has also stereo playing capability with LPT1 only too. 1. is it under plain DOS? 2. have you tried with different FT2 versions too (2.06, 2.08 or 209) are very different from each other with its behaviour. 3. expansion cards which use the same IRQs or ports? jxalex wrote: how it behaves if you have not ticked that "Stereo", but have the LPT1+LPT2 ? It does not hang, but playing using only LPT1 port (0x378). I see with the help of some Verilog watchpoint that there are no calls to port 0x278 in this mode. jxalex wrote: The FT2 has also stereo playing capability with LPT1 only too. I know, but when multiplexing channels with LPT1 only the frequency of samplerate should fall. Is not it? 1) Yep, i running FT2 under plain DOS. 2) Yes, i am trying different FT2 versions - 2.06, 2.09. 3) I don't use IRQ at my card and disable onboard LPT1 port in BIOS CMOS setup. My config: 430TX motherboard with iP166 MMX, 128Mb RAM. At first I thought that perhaps if the BIOS do not recognize the LPT2 then it has some trouble but then it is not the case if it was running already with that. How it behaves on other machine which has the 2 LPT ports? Also if the machine has its LPT port adress something other? Sometimes there are very strange or ridiculous reasons at first point which does not make sense at first. *trying with lower memory amount? (16MB for example when thinking about 8237 controller). * Clocking down the memory timings and bus speeds. * Swapping the videocard for some other type? And just one change in time. Also: does it run with other music software which can use 2 LPT ports? MODPLAY 2.19, Megaplay, and other covox based players? jxalex wrote: How it behaves on other machine which has the 2 LPT ports? Also if the machine has its LPT port adress something other? I have no other real machines with two LPT. I compiled 86-box emulator (PCem fork) from sources - It supports 2 LPT ports and can emulate COVOX on each of them. It can also emulate 430HX/VX chipset and Pentium class processor, so, emulation is very similar to my real configuration. I chose ASUS P/I-P55T2P4 motherboard, Pentium 166 CPU and S3 Trio 64 videocard. Booted up and.... The behavior of the FT2 is 100% repeatable behavior on a real machine - sometimes hung up, sometimes crashes with registers dump. I repeat, separatly I can freely switch between LPT1 or LPT2 output - it's okay. 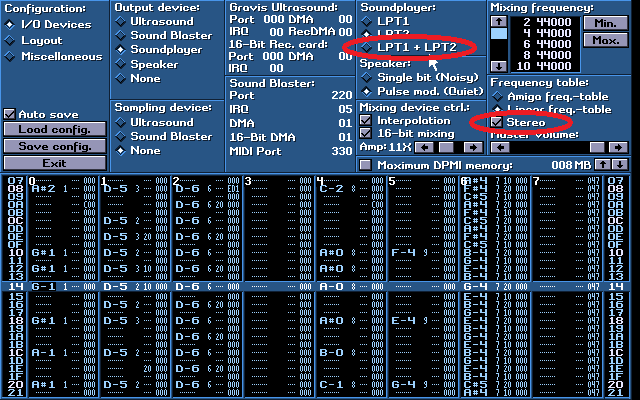 If machine or emulator has the same port address with something other i think i don't listening music when switch to LPT2 from LPT1. jxalex wrote: Sometimes there are very strange or ridiculous reasons at first point which does not make sense at first. In 86-box emulator i can do it simple, but this 'magic' doesn't work here. I'm pretty sure that this is a software bug in the FastTracker 2. Perhaps due to the fact that no one really used this feature or tested it. jxalex wrote: Also: does it run with other music software which can use 2 LPT ports? MODPLAY 2.19, Megaplay, and other covox based players? Yes, it really seems the software bug, but just try with the MODPLAY (the SOUNDCLUB is the another one which uses 2 LPT ports) and Megaplay. I can put together a machine with 2 LPT ports and try this myself here too later. So far I did not used this 2 port feature becouse before I got the 2 LPT cards, I already got the Gravis. And during 2 LPT port on those ancient times I saw 2 machines run only Megaplay and Soundclub. by the way, out of curiosity... Why? trying with COVOXes just for fun? Are You doing such debug-tracing with FT2 "becouse it is there"? Tronix wrote: I know, but when multiplexing channels with LPT1 only the frequency of samplerate should fall. Is not it? That is correct. There are also implementations which go from 8 bit to 4 bit per channel while keeping the samplerate, but those are quite uncommon.